Combine the pear with the water in a blender at medium speed until the pear has completely dissolved. Set aside and discard the remains. Mix the pear juice, sugar, honey, ginger, lemon juice and nutmeg in a small pot over medium heat. Reduce the heat and let boil for 5-8 minutes until the sugar and honey have dissolved. Remove from the heat, strain and let cool completely. Fill two large cups with ice, and then add 8 ounces of soda to each and 4-6 tablespoons of the pear juice. Mix well and serve immediately. Keep the leftovers of the pear juice in a refrigerated glass container. 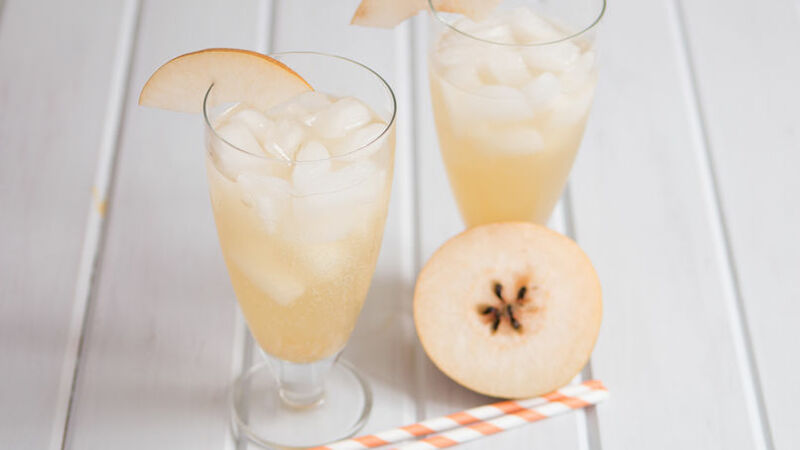 This delicious foamy Asian pear and ginger drink is perfect for the hot days. Best of all, this recipe will give you enough pear juice to prepare it a few times. Keep this recipe in mind when you have unexpected guests, just add soda to the pear juice with a bit of ice and you're done!